my ridiculous sense of smell | Where's Zoe now? Wine and pancakes and sandwiches. So besides winning the War on Pigeons (I am still proud of myself), what have I been up to recently..? Went wine tasting a couple of weeks ago with some friends on a gorgeous Spring afternoon. Rolling hills, rows of vines, magic light as the sun got lower. I hadn’t realized how much I’d needed to get out of the city until I squatted, absentmindedly patting a friendly farm dog, my eyes drinking in the open space in front of me. Turin is a beautiful city, but sometimes you need a distant horizon. My friend C. and I tried to go out for brunch one Saturday, but brunch isn’t really a familiar concept here. “How about we host our own pancake brunch on the Monday public holiday?” I said. So we sent out a group message and got a handful of people saying they’d come. “But you’d think the idea would be more popular!” she said… so we went on a bit of an invitation spree at church and suddenly we were spending the Sunday afternoon thinking about what we’d do if the number of people coming greatly outnumbered the number of chairs in my apartment. In the end, we made pancakes for 15 people (only 3 in excess of the number of seats! ), using 5 batches of this recipe which is the best (I know 3.5 tsp of baking powder sounds ridiculous, but it works! and you can’t taste it). We had a lovely brunch/afternoon of sitting around chatting with old friends and new. I even busted out my emergency Tim Tams later in the day, which is a sure sign of a good party. Was at dinner on Saturday night with another friend A., and partway through a couple sat down at a table near us. The woman was so! familiar! I spent the rest of the meal wracking my brains, How do I know that woman? Should I go over and say hi? On the bus ride home, Does she live in my building? Or maybe she’s a friend of a friend? I’m sure I know her, I hope she didn’t see me and think I was blanking her. Finally, as I was lying in bed… Oh that’s it! She works in one of the lunch places near my work. So probably a good thing I didn’t go and say hi, since the full extent of our prior contact is “Prendo un panino” and “3 euro 50”. This entry was posted in Italy, Living in Turin and tagged expat, food, living abroad, my ridiculous sense of smell, pancakes, recipe, travel, wine on April 26, 2016 by Where's Zoe Now?. Notes from my extremely glamorous life: Spring! It’s grey and rainy here in Turin — must be spring! Though to be honest, after a year of nearly non-stop dry weather, the rain is a welcome change. We’ll see if I’m still saying that after it rains all week like it’s forecast to. In the end, things worked out, and I made friends and I’ve come to love this city, even if the weather here is frequently terrible. Even with the rain, it does feel like spring here. It’s noticeably warmer, and the trees are blossoming and budding leaves. Of course I haven’t gotten around to getting a photo of this in Turin yet, so the picture for this post is from Baltimore the other week. Fortunately, I don’t get hayfever, with one exception. On International Women’s Day in early March, the tradition in Italy is to give women wattle flowers. There’s a whole separate blog post that could be written about “getting flowers” vs “getting equality”, but I have a more immediate complaint about the practice: I am allergic to the flowers. Sitting on the tram in the evening of March 8, with every woman on board carrying a sprig of wattle bloom, was a rather eye-watering, itchy-nosed experience. In other nose-related news, though: I was at my friends’ annual Easter Monday barbeque last week, and I could smell the meat cooking. This was quite exciting, because a) it was delicious, and b) last year, I wondered why everyone was so politely talking up how good the food smelt when there was clearly no odour coming off the barbeque — this was just before I realised I’d lost my sense of smell. So… Progress! This entry was posted in Living in Turin and tagged anosmia, expat, hayfever, hyposmia, living abroad, my ridiculous sense of smell, smell, spring on April 4, 2016 by Where's Zoe Now?. Here’s a dramatic opening line for you: A year ago this weekend, I was hit by a car while crossing the street. This is the story per the police report and my hospital notes: I was hit by a green Fiat at 3:15 pm; I arrived in hospital fully conscious; I had fractured my skull in two places and suffered some bruising and minor bleeding on my brain; no surgery was required; CT scans and ultrasounds confirmed I had no other injuries; I spent 9 days in hospital for observation; a subsequent MRI 6 weeks later indicated satisfactory progress towards recovery and no need for further intervention. That story sits comfortably in a folder of forms and papers with official letterheads, but it feels rather incomplete. This entry was posted in Living in Turin and tagged accident, adventure, anosmia, brain injury, friends, hospital, hyposmia, life, living abroad, mtbi, my ridiculous sense of smell, stories, tbi, writing on February 28, 2016 by Where's Zoe Now?. I was reading a fantastic blog post the other day about how we shouldn’t tell women (and, I think, people generally!) what is brave for them. Which is so true! I moved to Torino not knowing anyone here and I wouldn’t call that brave, for me. Maybe it would be brave for you! I’m not saying it to boast. But for me at that time it just felt like an interesting thing to do. This entry was posted in Living in Turin and tagged anosmia, baking, cake, christmas, christmas cake, food, hyposmia, my ridiculous sense of smell, smell on November 23, 2015 by Where's Zoe Now?. Zoe’s grumpy hot beverage reviews. You may remember a few weeks ago I declared I was going to find a good (herbal) tea to get me through the winter, with the requirement that I want to be able to actually smell the tea even with my wacky sense of smell. I remain optimistic! I have learnt all kinds of things about what I can and can’t smell at the moment! I have consumed litres of hot drinks! I am yet to find something that really works for me. Pam Supermarket own-brand instant coffee: Not a tea, but I have been drinking a lot of this recently, since I can’t smell/taste the difference between good and bad coffee. It’s cheap. I can use it to make a mug of coffee, which I realize I’ve kinda missed while living in Italy. I can leave it in the office kitchen and no-one will ever steal it. It gives me a stomach ache if I drink too much and it’s not Fairtrade which gives me middle-class guilt if I drink it at all. Still an overall top pick at the moment. 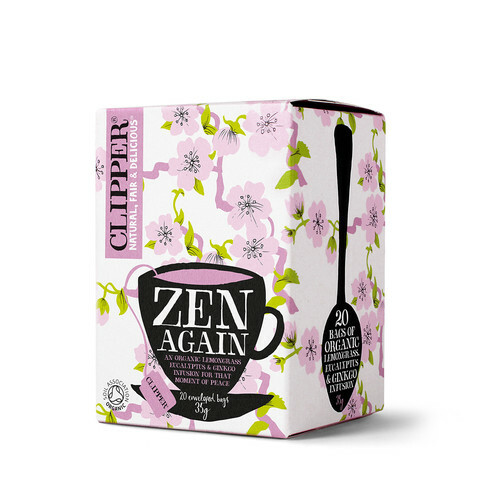 Clipper Zen Again Infusion: This lemongrass, eucalyptus and ginkgo infusion made me angry. It started with the packaging. Pink flowers. It was a good thing I’m not a man, because apparently lemongrass and eucalyptus has a gender. “For that moment of peace”, printed on the front. I picked it up. On the back: “A … spa-inspired blend … Perfect for those moments of reflection.” This was the women laughing alone with salad of herbal tea packaging. Well, for the price it was being sold at, I was going to need a moment of peace. Several hours of peace, probably. I gritted my teeth and decided to take a risk and give it a shot. Turns out I can’t smell eucalyptus. Or lemongrass. At least I can taste the nettle they’ve added to fill out the bags. Clipper Orange and Coconut Infusion: The box is orange and says “tropical”. It probably would be, if I could smell the coconut. I can taste the orange, at least, but without the coconut it’s awfully reminiscent of the orange oil we used to use as a cleaning product when I volunteered in an Oxfam shop as a student. Despite this, it’s not unpleasant and I will definitely finish the packet. Overpriced organic Rooibos: (I can’t tell you the brand-name because I accidentally left it at my desk at work.) Comes in dinky foil-wrapped teabags which don’t sit well with me as someone who watched a lot of Captain Planet as a small child. I can’t smell the rooibos, but I’ll be optimistic and say it’s a subtle smell. The taste is adequate, but, well, it’s also quite subtle. (“Subtle” is my new favourite euphemism.) The next rooibos I buy will probably be the cheaper non-organic stuff. Pam Supermarket own brand black tea: This smells of tea. It tastes of tea. It doesn’t smell or taste of anything more sophisticated than that, which doesn’t bother me at all, since I doubt anyone can smell or taste anything much in this 1.19 Euro for 25 bags packet of tea. I used to think of myself as a bit of a tea snob so I hate that I like this tea, but ehh, life’s an amaing journey and all that. This entry was posted in Living in Turin and tagged anosmia, food, hyposmia, my ridiculous sense of smell, parosmia, smell, tea on October 18, 2015 by Where's Zoe Now?. Got any good recipes with no onions or garlic? Or: What it’s like to have a wacky sense of smell. If you’ve been following along for a while, you might remember that back in April I realised I couldn’t smell anything. Not in the sense of, Yup, I’m living in a clean (enough) apartment without any unpleasant odours, but in the sense of smelling nothing. A sort of silence for the nose. The realization came as something of surprise for me, since a working sense of smell is something you tend to take for granted, but apparently losing your sense of smell is a thing that can happen when you injure your head, which I had done a few weeks prior. This entry was posted in Uncategorized and tagged anosmia, head injury, hyposmia, life, my ridiculous sense of smell, smell on August 30, 2015 by Where's Zoe Now?. Losing my sense of smell just ruined gorgonzola cheese. So… The most blog-able thing I’ve done recently was to lose my sense of smell. Not quite sure when it happened. Maybe last weekend. Do you know what’s really hard? Wracking your brains trying to think when you last remember smelling something. Seriously, try it — see, now you’re also wondering if you haven’t smelt anything for weeks. This entry was posted in Italy and tagged anosmia, food, head injury, hyposmia, life, my ridiculous sense of smell, senses, smell on April 12, 2015 by Where's Zoe Now?.